Where Do I Get CabbageAU? Just getting started with Cabbage on OSX. I'd like to try CabbageAU. Where do I get it? Can you try the ones that installer with the current OSX installer? Note that they are still very much under development! I downloaded the latest OSX installer from the website. It didn't seem to install any AU plugins. 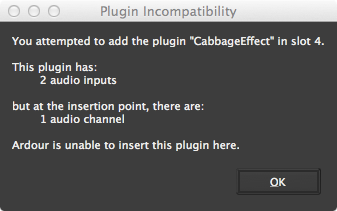 The docs say "The installer places the two different Cabbage AudioUnit's into the expected OSX location so they should be immediately accessible in your DAW." Where do the AUs get installed? I looked in /Library/Audio/Plug-ins/Components but can't see them. Did you check both library locations? Your local library, and the main library? That is where they should be installed. Can you check your music folder too and see if the installer placed a cabbage folder with some examples there. Putting in a blank line seemed to chop off the start of the first error msg. Leave it with me. I will install Ardour and take a look. So that's not great at all. I'll probably need to ask the Ardour devs how it handles resizing of plugin. In the meantime, I've zipped the AUs that work for me. Can you drop them into your Library folder, replacing the previous ones and try Ardour again. You may need to clear your AU cache. I use a program called Onyx(http://www.macupdate.com/app/mac/11582/onyx) to clean my AU caches and other little OSX oddities. Note that it's quicker if, when using Onyx, you don't verify disk on startup. And you only choose to clean User settings. No need for a restart if you just clean User settings. I'll see if I can figure out what's going on with the plugin window size. It resizes fine in other host. 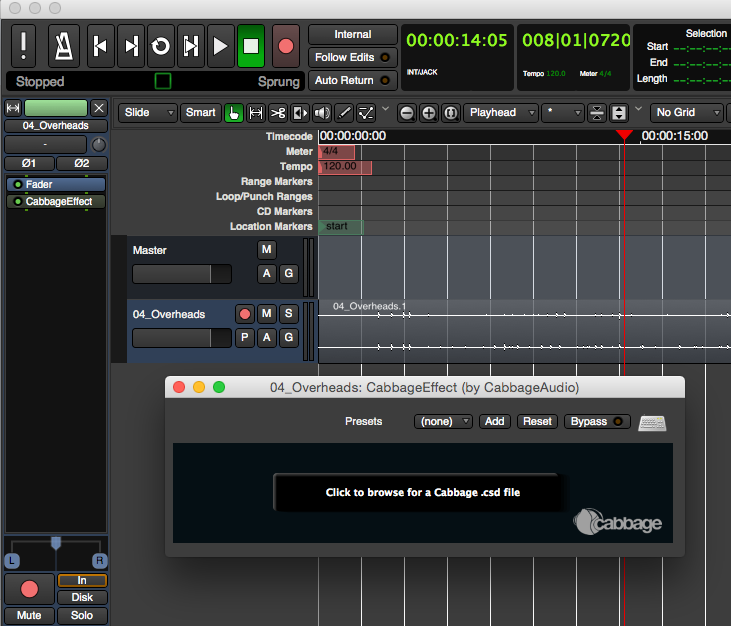 Hi, I'm using Ardour 4.7.13 on OSX 10.9.5. For what's it's worth, it seems there may be an issue with how Ardour handles the resizing of its AudioUnits. The Ardour devs gave me some useful pointers that I'll try out later, Hopefully I can find a workaround. Thanks, I'll try installiing them and see if Ardour loads them. Cheers. Do you have any other hosts that can handle AUs? It might be worth checking them there too. I tried loading them again with Logic Pro X and that failed too. I'll try again with the newer versions and let you know what happens. I installed the newer AUs. The effect plugin loads into Ardour. I can open it and load a .csd however there is definitely a windowing problem. I've only had a brief chance to try it out but it seems that if the GUI fits in the initial window it's ok, but if the gui has to expand or scroll it doesn't display properly. it only shows a portion of the GUI. Logic Pro X appears to be similar. The effect plugin loads and I can load some .csds but some are causing an instant crash. For example, BounceDelay is fine, but CompressorExpander causes an instant crash (the plugin window appears to resize then boom!). Thanks for checking this out. Does Logic resize Ok once a plugin has loaded? In the past I've been using a build script to generate these AUs, but I think there might be an issue with it. From now on I will build them directly within XCode, which is how I did the effect component. I will try to run off a synth build for you tomorrow when I'm next at my OSX machine. In the meantime, can you note down any plugins that instantly crash? I can check them with the debugger to see what's going on. I'll try the plugins in Logic but I'm really more interested in Ardour. Also, I notice that the effect plugin is stereo. Is there a mono version? I don't think Ardour lets you load a stereo effect onto a mono channel. There are no mono plugins I'm afraid. But all my stereo plugins work fine with Ardour. On Linux at least. If this was a problem then Cabbage wouldn't load at all on any mono tracks. Can you confirm that this is the case? That's odd. I can do it here without any issues. Must be an AudioUnit issue. One other thing we may explore is using LV2 plugins. These might be better as they would work the same as regular VST plugins, i.e, you simple export your plugin from Cabbage and it's ready to go. You don't need to load instruments from a single plugin instance in Ardour. It would probably be cleaner. LV2 would be great! I've already built the meters.lv2 and some of the DPF plugins and they work fine. How long would implementing LV2 in Cabbage take - is it a long-term thing or relatively quick?